My critical theory class from university seemed far away when I started reading Harris M. Berger’s study, Stance. In that course, Reception Theory was probably the most difficult one to grasp, with the most theoretically abstract readings, readings for the most part founded in philosophy. Realistically, the world does not know enough about the brain or perception, and cultural context varies considerably from person to person. Joe can like or dislike something but Jane’s tastes are different; subjectivity is the key to this experience, and thus Berger is attempting to explain a very complex phenomenon. To look at subjectivity through reason, what Berger is attempting to do, seems a daunting task. Harris M. Berger approaches these questions with gusto, however, and for that I must give him credit. His grasp of key intellectuals and their theories are evident in the text. The purpose of his analysis is to explore the larger issues associated with a person‘s “lived experience,” of diverse phenomenon, and especially music. 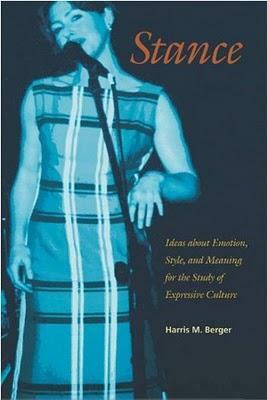 Music is central to Berger’s work as a professor of music and performance studies in Texas. Luckily for readers, the author is not just diligent about defining the terms he uses but also writes with acuity and finesse. For example, for him “stance is the manner in which the person grapples with a text, performance, practice, or item of expressive culture to bring it into experience.” Stance is a much more elegant word than posture, position or interpretation but all three refer to the work that is done in the reception of an occurrence. Berger is also generous with examples in an attempt to contextualize some of the more complicated passages. The narration of some of his own experiences is quite fascinating, and the first-person perspective, although it contrasts with the very formal philosophical discussion, alleviates our experience of the book.